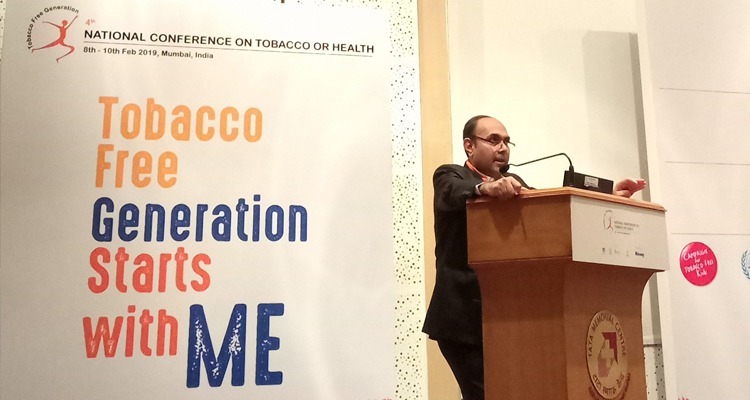 The 4th National Conference on Tobacco or Health (NCTOH), organised by Salaam Bombay Foundation in collaboration with Tata Memorial Hospital, Action Council against Tobacco and Healis – Sekhsaria Institute for Public Health, has been scheduled from February 8 to 10 in Mumbai. The inaugural session of the conference saw the participation of eminent dignitaries and government official including Pallavi Darade, Commissioner, FDA, Government of Maharashtra. Close to 350 participants and 10 speakers and more than 15 panelists from across India and abroad took part in the event. Keeping in tune with the objective of the conference, the day focussed on informing participants about the best practices of tobacco control, advances in advocacy, latest researches and ongoing efforts in tobacco control in India. Over the next two days too, the programme will touch upon several important topics such as awareness, public policy, addiction, cessation, second-hand smoke, taxation, smokeless tobacco etc. It will also focus upon some new topics that have gained importance only in recent years including environmental effects of tobacco, divestment from tobacco industry, productivity losses, new emerging tobacco products and so on. The opening day saw participants sharing their experiences and achievements as well as collaborating with other experts, industry representatives and stakeholder institutions to bring about a positive change in the society with respect to tobacco control. Through an array of sessions, discussions and presentations, efforts were made to ensure that the collective voices make a profound impact on drawing attention of the policy makers to the staggering public health menace that tobacco is. A series of topics including Tobacco Free Generation, Tobacco Cessation – The Current Scenario, Tobacco Economics and Taxation etc were covered through the day. The second day will see discussions and idea exchange sessions on other crucial topics like Bidi: poor man’s displeasure, reveal the burden and impact of tobacco use, monitoring compliance and overcoming obstacles in implementing tobacco control law, control of smokeless tobacco and areca nut, tobacco economics and taxation, Vendors licensing: The Next Frontier in Tobacco Control, Emerging young voices in tobacco control, Creative tobacco control campaigns and interventions in India, Tobacco cessation: Existing treatment modalities and innovations, Tobacco induced diseases: Diagnostic techniques and treatment, Prevalence of tobacco use and burden of diseases attributable to tobacco use, Tobacco industry’s tactics and interference, Tobacco control law: Challenges and measures for effective implementation etc. There will also be E–Poster sessions that will present a visual outlook to the topic. The closing day of the conference will include discussions and brainstorming on topics like Ten years of India’s National Tobacco Control Programme: A sustainable impact, Tobacco control: health professionals and AYUSH, implementing good governance in tobacco control through multi stakeholder involvement, tobacco control awareness and advocacy: Innovative interventions, tobacco industry interference etc. All through the three days of the conference, special efforts have been put to ensure regional and gender balance and participation of delegates from across the country.